As I was on my way up using the escalator in the North Parking vicinity, I felt drops of water on my head. I looked up, and there on the ceiling was a growing water stain. It was a leak no doubt from the rain overspout (or whatever thingamajigger contractors call it). Hmm...didn't the Trinoma just open two years ago? Well, if this is the kind of shoddy work Ayala Land employs in its buildings these days, I no longer wonder why its income plunged by 50 percent in the first quarter of 2009. Would you buy a condo from the company if it gives you leaky ceilings? Didn't think so. Like I've said before, and other mall visitors have confirmed it as well, Trinoma is really a depressing mall to go to despite the massive amounts of foliage and bright lights in its stores. Parking is confusing as well as the store locations, it's just chaotic. There are no automatic flushes in its toilets' while the better-smelling pay lounges are located in way out of reach places, instead of central locations. And it's freaking noisy! It's starting to become another regular SM Mall w/ its loud music, and with its bad acoustics you'd think you were in Divisoria instead! It's so not like an Ayala mall, I tell you. I mean, if you go to an SM Mall at least there are no surprises. You know what you're getting. Loud and crass. Trinoma tries to reek of class but fails miserably bec. the owners think the rich folk from Caloocan and QC have bakya sensibilities. Thus the architecture and interior design. WTF, coño! 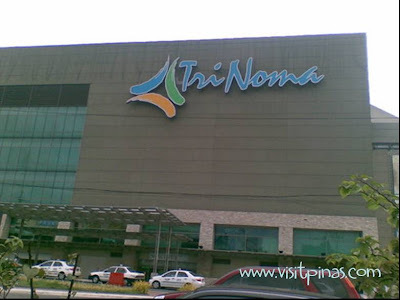 So is there nothing to love about Trinoma? I admit there are a few, w/c is why you will probably find me there every other week, esp. if there's a new film in town. For instance, I like the variety of goods that Landmark supermarket offers (and btw, it has self-flushing toilets in its regular restrooms). And I enjoy watching films in the mall's roomier cinemas. Some of the restaurants are noteworthy (Cyma, Thousand Cranes Shabu-Shabu, Coffee Bean and Tea Leaf, Cibo, Peking Garden), and it has Piandré Salon where I get my pedi, and Toni & Guy Essensuals where I turn to for a haircut. And did I mention Red Mango frozen yogurt? Red Mango is a franchise from surprise! South Korea. But it really became a hit when the company expanded in the U.S. So far, it has three local outlets - Trinoma, Eastwood, and Megamall. I love it because it's creamy and tart. Wonderful mouthfeel, but if you don't watch out, will give you brainfreeze! Brrr. (I had two servings of each flavor the other day and ended up w/ a slight headache.) I like both the original and green tea flavors, straight up, no sprinkles. I'm surprised that the stall in Trinoma never runs out of customers. Who would've thought that Pinoys would learn to appreciate yogurt? Could be that we're really more health conscious now or just bec. the product is still new in the market, and something different from the usual ice cream concoctions we've been used to? It has great price points - P80 for a single scoop for the original (P85 for the green tea), plus P20 for a single topping (fruits, nuts, or cereals). Try it. While Red Mango is largely acknowledged as the original "tarty" yogurt, it was actually pINKBERRY that made it big in the US, even scoring an endorsement ad from American Express for their new PLUM card. I do think that Red Mango is superior flavor-wise but there are more pINKBERRIES than Red Mango here. pINKBERRY beat them to the punch, ika nga. Another one gaining popularity is Yogurtland - they sell the yogurt by weight - baka mataranta ka! On a private note, ti-nest drive mo na ba? Nakaraos din ba yung Red Mango? Oh yes, I know about Pinkberry. What I mean is for a South Korean company to make it big, it had to expand to the U.S. And that's something noteworthy from a business standpoint. Di ko pa na-test drive. I actually forgot to put it in my bag. tanga. haha. Thanks for the padala sweetie. Pangs, I'm not your "pre". Tawagin kitang "sis" jan kita mo. Accdg. to Red Mango's web site, the smallest serving has 18g of sugar both for the original and green tea flavors. If you put toppings like fruit or some cereals, it will increase. I don't think the sugar content is large enough to make you hyperglycemic though. Of course, I could be wrong on that so check w/ your doctor to be sure. Who'll win American Idol Season 8? My God she's so big!